Major X #1 VIP launch party package! Celebrating with a signing on opening weekend at Phat Collectibles in Anaheim, Ca., we are offering 2 incredible packages with special pricing at for this event! 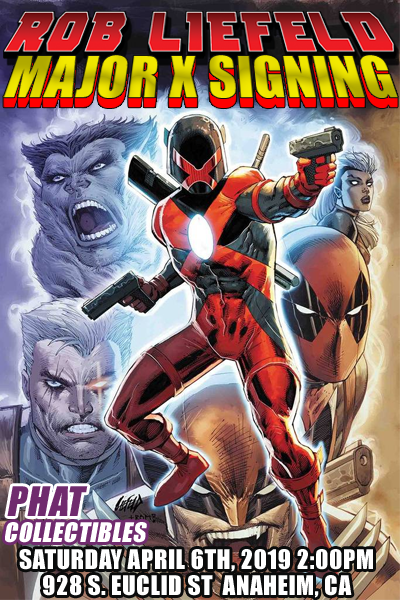 MAJOR X #1 EXTREME VIP PACKAGE- includes all the perks of the regular Major X VIP package but with both of the super rare DEADPOOL #10 Major X variants created and signed by Rob Liefeld! Total of 6 comics, 5 exclusive variants available only through Rob Liefeld Creations, a signed print and a photo! Both super rare Deadpool #10 Major X variants created and signed by Rob Liefeld. Looking for the Major X #1 VIP launch party package? You can see it here. Interested in the Major X Private Experience? You can book it here. You will pick up your package at the launch party on April 6.. You can bring a copy of your receipt but we will have a list of all who purchased the VIP Package. Check your junk folder, sometimes our receipts end up there.